If you want to sell junk silver coins but aren’t sure how to get the biggest return on your investment, then the Coin Values team has some advice that may help you score a better payout. Investing in bullion can be very profitable if you buy silver coins when prices are low and sell silver once it reaches a point where you can earn a decent percentage over what you spent to buy your coins. Buy newer junk silver coins – Junk silver coins usually have a slightly higher premium over their intrinsic value than bullion silver coins like American silver eagles or silver art bars. However, among typical junk silver coins, the “cheapest” are usually 1946-1964 Roosevelt dimes, 1932-1964 Washington quarters, and 1964 Kennedy half dollars. Other junk silver coins, including Morgan and Peace silver dollars, have much higher premiums since they are somewhat scarcer than the newer silver coins. Get a feel for the high-low silver price cycles – Every bullion trading day is different, but during some streaks, you may notice that silver trades lower at certain times of the day and higher at other periods. For example, during one recent week, silver had a tendency to trade low during the 6 AM to 9 AM period, then it spiked around noon, and closed on a downward trend. Of course, this is not always how silver prices cycle throughout the trading day. If you’re about to buy or sell junk silver coins, check out the silver activity and see if you can spot any trends. Buying and selling junk silver coins is always a gamble, but perhaps you may get lucky and score a slightly better deal at one point in the day than another. 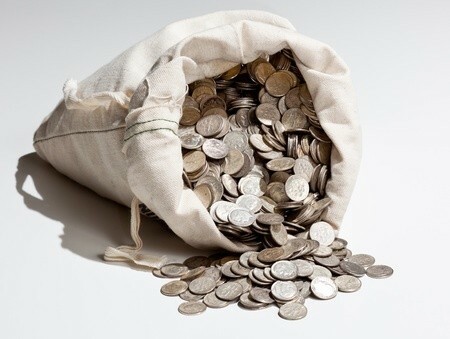 Buy coins in bulk quantities – It’s a buy-in-bulk world these days, and you’ll notice that you could save a substantial sum of money if your buy your junk silver coins in bulk. The savings you earn buying larger quantities of junk silver coins will potentially help you reap a slightly higher return on your investment when you sell your silver coins. Try to score a deal – Look for special deals when you’re buying junk silver coins, including offers such as free shipping. Even the, say $10, savings on free shipping can help you earn a slightly higher yield over the initial investment when you sell your junk silver coins. For that reason, it pays to subscribe to emails from coin dealers or bullion distributors from whom you wish you buy junk silver coins. That is the best way to look for coupon codes and other deals that can help put more money in your pocket. Sell silver coins to a dealer that specializes in bullion – The best places to sell junk silver coins are those where the dealer focuses mainly on buying bullion coins. While silver is worth the same amount pretty much everywhere at any given time, you may get a slightly higher premium from a coin buyer who specializes in junk silver coins and other types of silver bullion. This is the case when selling any types of coins – always sell to a professional who deals mostly in a given area of coins to possibly improve your odds of snagging a better buy price. If you are planning to buy or sell silver coins, remember that some silver coins may fetch a better return for you in the numismatic market than in the silver bullion arena. If you have time, check through your junk silver coins before you sell them and hold aside any high-quality pieces (these sometimes sneak into rolls and bags of junk silver coins). If any of your silver coins date from the 1950s or earlier and appear to grade at least Extremely Fine or higher, then those coins should be sold as numismatic coins to a coin dealer specializing in U.S. silver coins.